A California man is giving thanks for his “miracle” after a car crashed through the window of a gym where he was working out in Culver City. 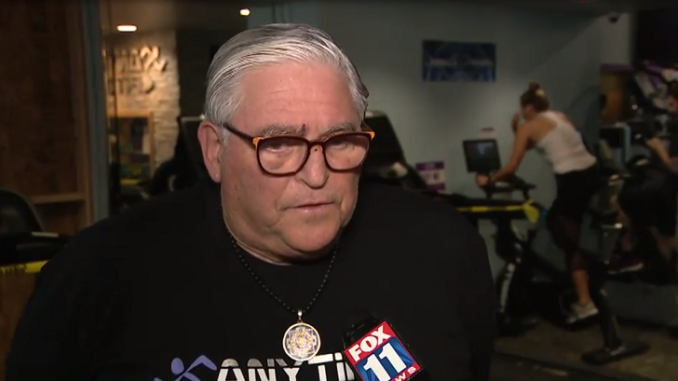 Retired teacher, Samuel Kiwasz, was warming up on a treadmill for a group training class at the “Anytime Fitness” gym at 4130 Sepulveda Boulevard on the morning of March 29, when an SUV plowed through the building and slammed the treadmill into the back wall as shown on security footage highlighted by FOX 5. The door to a back office was not locked, so it was pushed open by the crash and that may have saved his life some onlookers suggest may have saved his life as well. Several trainers and athletes like Chris Cueva ran to the aid of the retired teacher and tried to give him as much help as they could. “I ran over here and saw blood coming out of his mouth. And I remember picking him up, sitting him down, wiping the blood off his face and the first thing he told me was ‘I’m sorry for ruining everybody’s workout.’ I was like ‘you don’t get to apologize,’” Cueva said. Kiwasz reportedly suffered only a broken nose and some scrapes. The driver of the SUV was also shown on security video checking on Kiwasz but then tried to get back in her vehicle before she was stopped by an undercover police officer who held her until backup arrived. She reportedly told authorities that her brake pedal didn’t work. Despite the accident, Kiwasz who calls himself a goodwill ambassador for the Southern California refuses to let it keep him down. “It’s not what happens to you. It’s how you deal with it,” he said.